The A629 Salterhebble to Shaw Hill transport scheme is entering its final stages with the recent completion of work at Dryclough Lane. Final resurfacing work took place on Dryclough Lane last week and the road has now reopened to traffic. Major access improvements and junction remodeling at Dryclough Lane have helped to deliver improved and safer walking, cycling and public transport journeys, and reduced congestion along the A629 corridor. The junction around Dryclough Lane has been completely remodeled, creating additional capacity into the hospital. 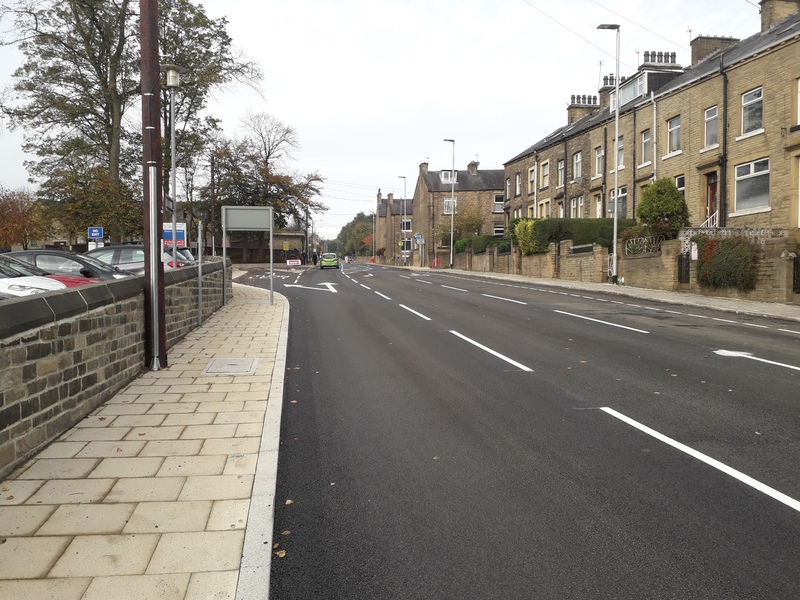 There is also a new slip lane from Huddersfield Road towards Dryclough Lane, improving access to the hospital and reducing delays for people using Dryclough Lane to get to Skircoat Green. New traffic signals have also been installed, which will communicate with each other via smart technology. The signals, when optimised, will be responsive to traffic conditions and make a significant improvement to traffic flow throughout the area. The final phase, over the next few weeks, will see completion of the resurfacing work up to Falcon Street and on Salterhebble Hill. After completion of the Salterhebble phase, works will be left in a position to continue seamlessly with the next phase of A629 corridor upgrade programme, which is focused upon the Calder and Hebble junction. “The Salterhebble element of the overall A629 project has been an immense engineering challenge and I’m delighted to see it now entering its final stages. The work on the A629 scheme has been funded through West Yorkshire Combined Authority’s West Yorkshire-plus Transport Fund. The £1 billion West Yorkshire Plus Transport Fund is being invested over 10 years in more than 30 transport infrastructure schemes across West Yorkshire and York, designed to create around 20,000 new jobs and add £2.4 billion a year to the economy by the mid-2030s. The West Yorkshire Combined Authority’s Transport Fund has been part-funded through the Leeds City Region Enterprise Partnership (LEP) Growth Deal – a £1 billion package of funding to drive growth and job creation across the Leeds City Region. This entry was posted in Economy, Next Chapter, Roads and Highways, Vision2024. Bookmark the permalink.